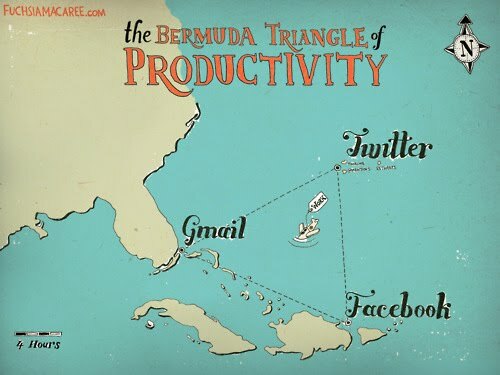 Does your productivity get lost in the triangle of these online distractions? Mine can. So how do you reduce the temptation of checking either your email, Twitter or Facebook every 5 minutes? Here are a couple of thoughts. I need to address the lie that every communication that comes through email/Facebook/Twitter demands my instant attention. The world will not spin off of it's axis if hours go by and I don't read or respond to my email. Very few things that I receive require urgent attention. Usually urgent stuff finds me via a phone call or text message. I don't need to be reminded by my computer or phone every time an email, or Facebook message or new tweet comes into my account. Too often these alerts are like the bell and I am the Pavlovian dog - responding every time I am alerted. The temptation is heightened for me because I do a lot of work in the "Cloud" and online, therefore my browser is always open. But there are also a lot of other projects that I work on, that don't require online access. Therefore, when I am working and not requiring online access, shut down the browser and get offline. Fundamentally it is ME who chooses to go down these productivity black holes, and no matter what tools or tricks I use, I can always choose to cheat. Therefore, I need to go beyond the symptoms and try also to discover what is at the heart. Am I trying to avoid a hard or difficult task? Do I seek out these distractions because they give me some kind of significance or affirmation that people are thinking of me to comment on my Facebook wall, send me an email, or Retweet my latest stuff? What's driving me to these distractions throughout my day?